Students interested in teaching music must complete the basic music major with a K-12 Music Education minor. Students and faculty work together to tailor practical teaching experiences to fit students' individual needs. Luther’s music education majors achieve almost 100 percent placement after graduation, a testament to the program’s credibility and reputation. Learn about FMEA, the student-run organization for Luther College music educators. Everything you need to prepare for meeting with your advisor. Includes 8-semester and 9-semester plans. Jill Wilson is Assistant Professor of Music and Coordinator of Music Education. 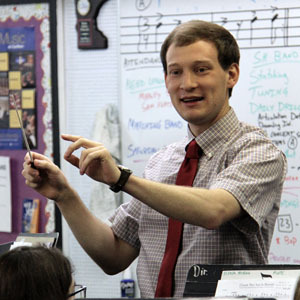 Learn how Willy Leafblad is using his talents and passion for Music Education in the classroom! Music maintained by Kristin Bjerke. Page last updated on 7 April 2019.